July | 2012 | "Not Now, Honey. Mommy Has to Blog." There’s Beauty in the Bad Days. 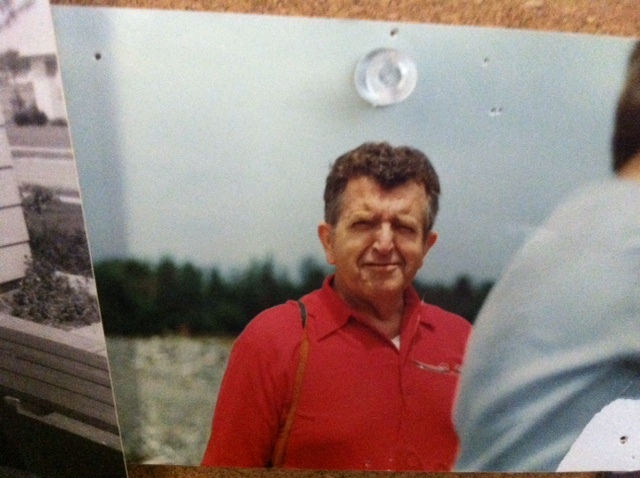 It’s been a little while since I’ve written about my dad. There’s no particular reason; sometimes life just gets in the way. My children’s school year wrapped up, and so did some other projects I was working on. My focus has shifted back to my 5 and 7 year-olds as they happily envelop me into their world of endless summer days and wind-whipped beach hair. For those who are new to my story, my dad is 88 and lives at The Inn, his term for his nursing home here in town, where he does his Slow Dance with Alzheimer’s and vascular dementia. Gratefully, he still knows me and my family, and my mother, the Silent Warrior and his bride of 62 years who visits him almost daily, and is responsible for the light washing over his face whenever she enters the room. But he’s still my dad. 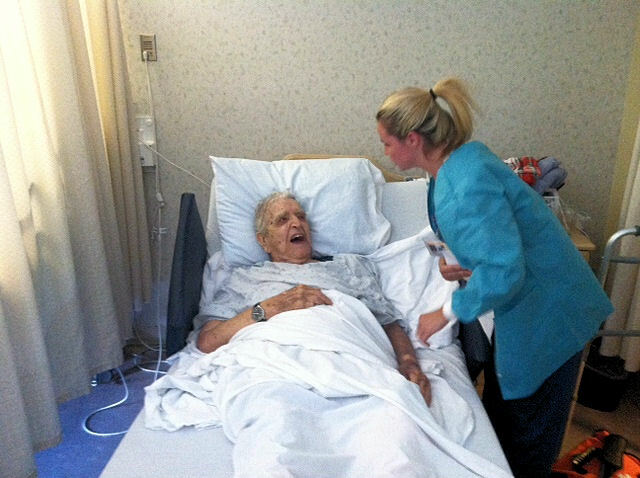 He loves to flirt with the nurses and make random small talk. His favorite accomplishment is earning the admiration of strangers through a humorous quip or corny joke. Though his memory is fading, I can always tell it’s a good day when these utterances or one-liners escape his lips. And you can feel the joy when he gets the line right. It’s a beautiful thing. My dad has had his ups and down for the last 6 years while at The Inn. 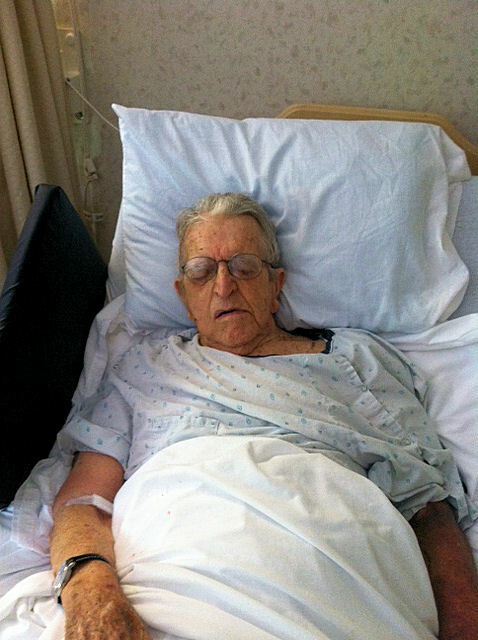 His health is frail. He’s had a host of maladies ranging from strokes, to mild heart attacks to COPD (Chronic Obstructive Pulmonary Disease) over the last 15 years. He is on a pharmacy of medications to keep him going, but you can always judge the kind of day he’s having by whether or not you see his walker, or a wheelchair in his room. Today I found the wheelchair parked by his bed. That’s never a good sign. 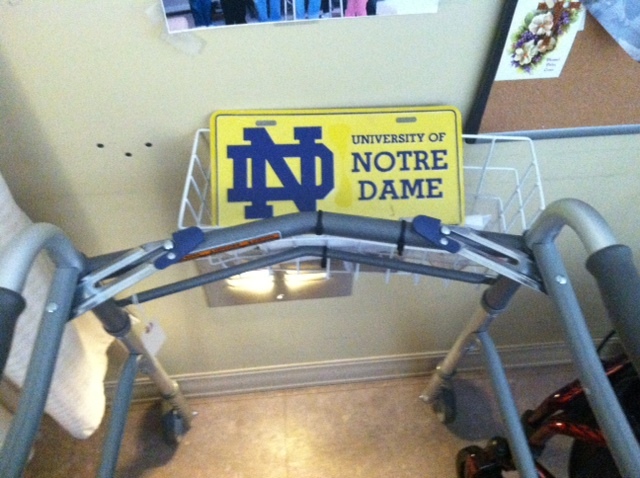 His walker – his trusted steel companion – was abandoned in the back of the room holding his beloved Notre Dame license plate my sister gave him that he carts around with him every day. I got a call this morning from his nurse that my dad developed a bad cold yesterday. The cold turned into a fever last night and for a man who is “chronologically gifted” (to use one of his catchphrases), this can sometimes throw a giant wrench in things. He is prone to pneumonia so they have ordered a chest x-ray and full panel of blood work to check what’s going on. 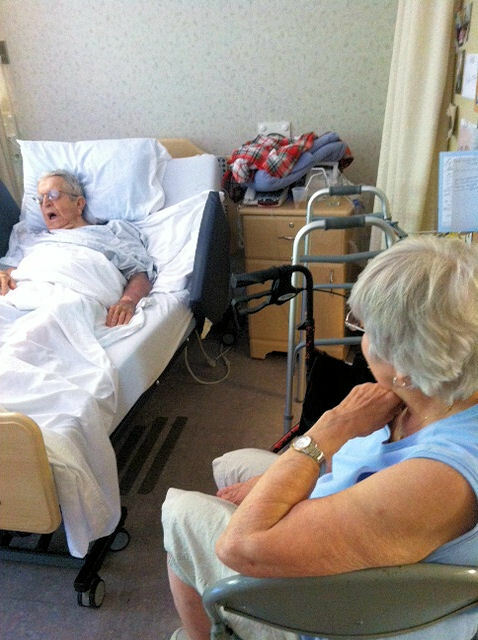 In the elderly and especially someone with my dad’s health history, things can change dramatically and fast. His dementia often worsens when he’s sidelined by illness. But as is typical with my dad, he still tried his darndest to charm the young woman who was now struggling to find his nearly invisible veins. He opened one eye and brightened up when he saw her bright pink shirt and weakly uttered, “Who’s this BEAUTIFUL young lady trying to help me?! ?” She giggled and said, “Oh, Ed! I’m SO glad to see you again. Can I get my hug?” He opened his other eye and tried his best to lift his arm around her. “You ALWAYS make me feel so good, Ed!” she beamed. My dad started to perk up. After all, there’s a lady in the room to charm! And my dad always comes alive – especially in the presence of strangers. 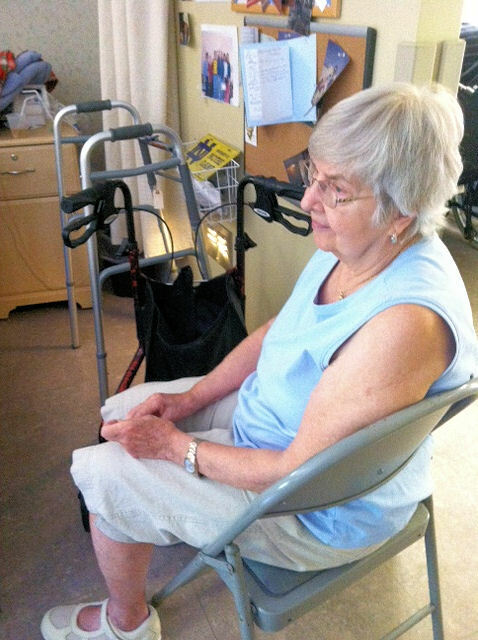 As she finished getting her samples and turned to leave, she leaned into my mom and said, “Your husband always makes it a point to tell me how much he loves you whenever I see him.” She continued, “I always look forward to seeing him because he makes me believe there is someone out there who will love me like that!” (She’s single.) I smiled and said, “My parents have a great love story.” She nodded in agreement and said, “It gives me hope!” Then she left, smiling. I looked over at my mother, sitting quietly by his bedside. I could tell there was worry in her eyes. She gives very little away, my mother, but you can usually tell by looking at her face that she is deep in thought as she looks watchfully at her husband. As my mom and I sat quietly in his room, my dad drifted off. 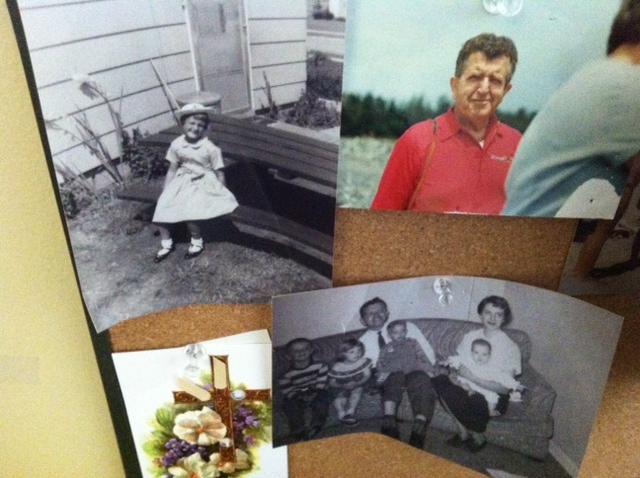 I glanced at the wall of his room at the family bulletin board we filled up with photographs to help my dad hold onto some of the fleeting memories. 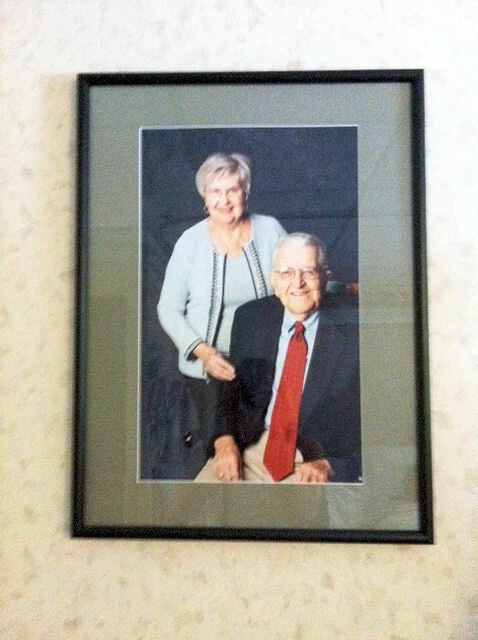 There were pictures of my parents as newlyweds, during middle-age, and present-day with their grandchildren. 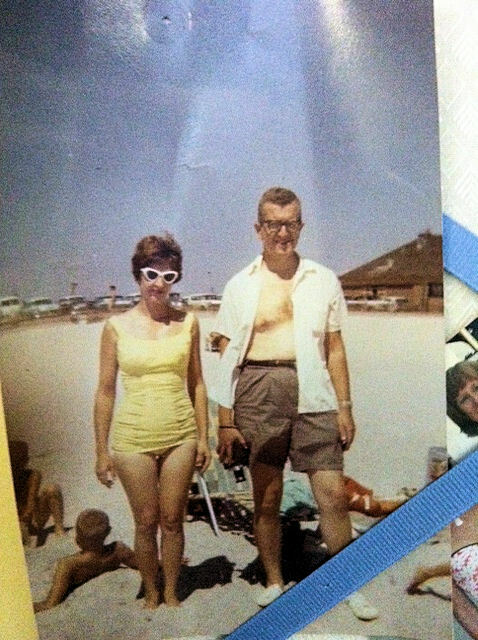 I spot a photo of my mom and dad as young parents at the beach with their little children. My dad looks youthful and happy with horn-rimmed glasses and a goofy grin. I imagine that day at the beach – long before I was born – with them darting around after their kids. My mom is dark-haired and slender; always beautiful, while I imagined she watched with delight as her babies raced around in the warm sand. 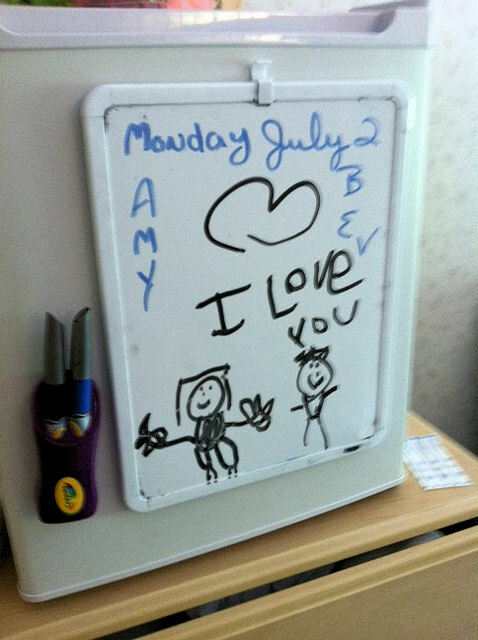 Then out of the corner of my eye, I spot the hand-drawn picture my 5 year-old daughter made secretly on the nurse’s whiteboard depicting her love for her grandfather. I observe all these photos on my dad’s wall. The snapshots of a lifetime. My dad’s memories preserved for him. Then I look back at my dad as he lies motionless in bed; his eyes closed as he continues to slumber. I look at the silver waves of hair draped messily over his head – still a full head of hair at 88! I see his weathered face peppered with age spots and deep lines. I look at his tired, heavy eyes. He starts to softly snore. My mother watches him and smiles. I see the look of love in her eyes. I wonder what she thinks? What is it like to watch your beloved companion as they navigate the twilight of their life? Is it hard? Is it frightening? Then it occurred to me that there is beauty in this room. Even on a bad day like today. Love can be found everywhere. It’s hanging on his bedroom walls, captured in the smiling faces of the people from another time staring back, perfectly preserved in a photograph. It’s in the caregivers who hug my father as if he were their own; who are inspired by him. It’s in a spouse’s eyes as they watch over their loved one with concern and worry. It’s in the silent prayers I know my mother is saying, as she steels herself for a possible period of decline. There is beauty in this moment because I am able to share it with my dad. As hard as it is to see him like this, it also a gift to be here with him. There is beauty everywhere. You just have to look for it.